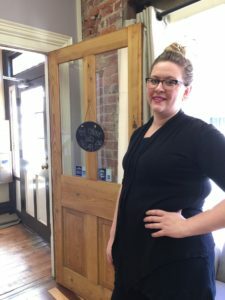 I’m Erin Baylongo, owner of the colour lab in downtown Waynesboro at 407 W Main Street. I wanted to do something different. I had a vision of offering clients a relaxing, spa-type atmosphere with a very customized experience. I remember coming to Downtown Waynesboro when I was younger. My great-grandmother would bring my brother and me for lunch and shopping. I knew I wanted a unique atmosphere with lots of character. With my past memories and eclectic feel, it was a perfect fit! The biggest challenge was getting the name out and making people aware that we are here. I wish I had known that owning a small business is wearing multiple hats, so it is very important to schedule in office time to do the book keeping as well as marketing and strategic planning. The biggest reward is knowing that my dream has come to life and I am investing in the future of myself and my family. It’s also been rewarding to have had many clients express how much they love the atmosphere here. They are able to really relax while receiving a service. To learn more about small business grants and training opportunities available to new Waynesboro busineses, visit us online here. We’re committed to keeping the entrepreneurial and small business spirit rolling in Waynesboro, with the inspiration of projects like Yama Mountain Gear.